When the Dallas Cowboys updated their performance and rehab facilities at their headquarters at The Star in Frisco, they chose to include the most advanced therapy equipment available, including a HydroWorx 2000 Series and two PolarPlunge Pools. By adopting this new modality, they hope to bring players back faster after injuries and remain competitive season after season. American football is a robust, competitive sport with intense fans, intense players and intense action. Man-to-man contact is a vital part of gridiron life, which can lead to athlete injuries. To improve the conditioning and rehab opportunities for their team, the Dallas Cowboys unveiled a new performance-related facility at The Star in Frisco. A few of their feature additions poised to become a vital part of their overall training and physical therapy program is a variable-depth HydroWorx 2000 Series underwater treadmill therapy pool with resistance jets as well as two PolarPlunge Pools that keep water temperatures at a therapeutic 50° to help control joint inflammation and enhance muscle recovery. HydroWorx therapy pools are commonly used by athletic facilities, especially at the collegiate and pro levels, to improve the reaction times of athletes and minimize down-time due to injuries. Research has shown that early aquatic therapy intervention can help speed up recovery times in numerous populations, including those involved in elite athletics. 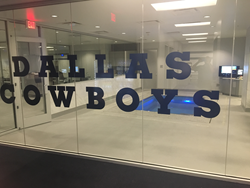 The HydroWorx 2000 Series and PolarPlunge therapy pools installed at the Dallas Cowboys World Headquarters and Ford Center at The Star in Frisco will help the team battle their way through the 2016-2017 season. Since the late 1990s, HydroWorx has manufactured aquatic therapy products with built-in underwater treadmills to enable rehabilitation professionals to more effectively offer their patients and athletes the opportunity to increase range of motion, decrease risk of falls and joint stress, remain motivated through the rehab process and speed the return to play for athletes and every day normal activities. Products such as the HydroWorx 2000 and 500 Series therapy pools, along with the new construction-free HydroWorx 300 system have revolutionized the face of aquatic therapy; in fact, HydroWorx technology is used by world-class facilities like the renowned Kennedy Krieger Institute, Cleveland Clinic, Frazier Rehab Institute and The Andrews Institute, as well as many elite athletic programs including the University of Oregon, Kansas City Royals, Washington Redskins, The Ohio State University, Manchester United and Chelsea Football Clubs and hundreds more.